Organisations can’t solve problems by using the same kind of thinking that they used when the problems were created. Technology is providing new tools to solve legacy problems. Most companies don’t even know the level of error and risk that exists in their list of payees, their Vendor Master File and the existing process to attempt to maintain them is costing you unnecessary time and money. Cybercrime and Business Email Compromise are increasing at alarming rates. EFTsure’s ‘Know Your Payee™’ means less work for your accounts department in on-boarding vendors onto your system. Fraud and error happens to everyone and the problem is growing. Don’t let your organisation be another statistic. Problems can exist even if you or your CFO don’t know about them. Let us show you how things can be done better. Don’t allow pride in your existing systems get in the way of improvements, time and cost savings. EFTsure’s ‘Know Your Payee™’ is easy to implement and maintain, we do all the hard work and you see all the beneﬁts. 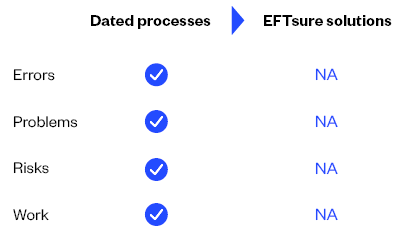 Business Email Compromise is a huge issue and risk that EFTsure addresses. You might be surprised to discover what your organisation’s level of risk is and how much time and money could be saved.